Welcome To Dining Diva Catering Equipment ltd, the Doncaster Catering Equipment company that prides itself on serving the local community with high quality catering equipment at competitive prices. Our Light Equipment Range includes, crockery, cutlery, glassware, table top displays, bar products, kitchen utensils, stewpans, frying pans, baking essentials, chef’s clothing, waiters aprons, storage solutions, disposables and janitorial products. Our Light Capital Equipment Range includes, counter top cooking equipment, fryers, panini grills, griddles, microwaves, blenders, soup kettles, toasters, mixers, slicers, veg prep machines, water boilers, bain maries, fridges, freezers, bottle fridges, ice machines and bistro furniture. Whether you are looking for products in our Light Equipment or Light Capital Equipment Ranges we offer everything required for your coffee shop, café, restaurant, hotel, Pub, children’s nursery/play group, soft play area in fact pretty much anywhere that produces food. With 30 years’ experience working with well-known industry brands we have the knowledge and the enthusiasm to offer our personal service whether on a small one off order or to help and advise on your new business opening order. As we are unable to show everything on our new website if you cannot find what you looking for please ring us to ask as we may be able to source from our library of suppliers. We provide competitive low cost delivery throughout the UK. So whatever your catering supply needs are we would love to discuss how we can help you. Local businesses based within the Doncaster postcodes DN1 – DN12 can enjoy free delivery on all qualifying orders, *minimum spend applies. 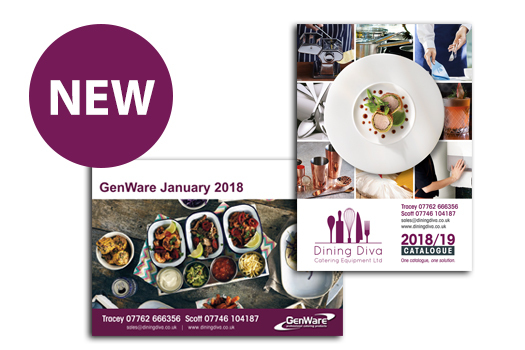 The latest GenWare and Essentials brochures are available now. Check them out online or download a copy. 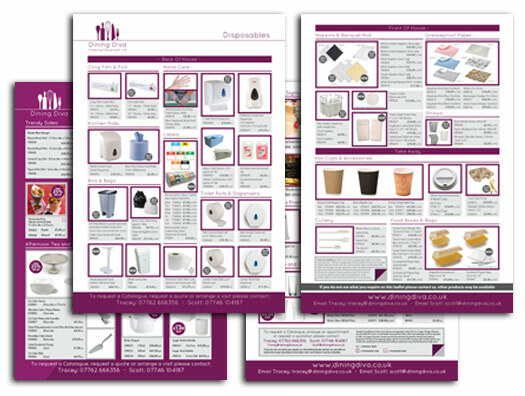 At Dining we regularly publish exclusive brochures full of special offers and discount prices. If you would like to be one of the first to know about these great offers register your details now. To see our full range of catering brands please check out out Suppliers page by clicking Here. ©2019 Dining Diva Catering Equipment ltd.